He said the door was open to a unilateral declaration of independence after Catalan officials said voters had backed secession with a 42.3% turnout. 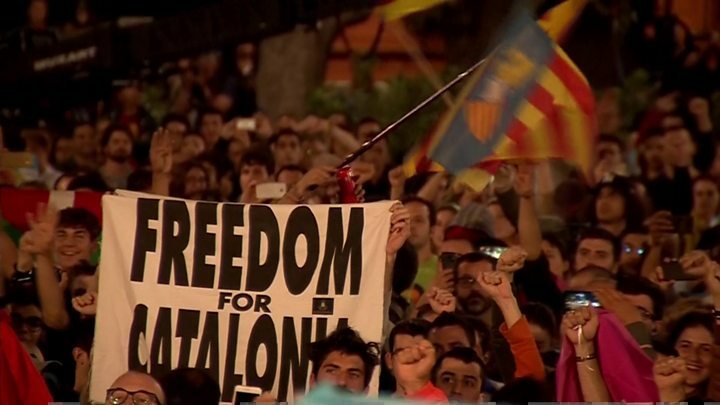 Spain's government has warned it could suspend Catalan autonomy. The constitutional court banned the vote and almost 900 people were hurt as police tried to stop it going ahead. Officers from the national police and paramilitary Civil Guard seized ballot papers and boxes at polling stations. Spanish Prime Minister Mariano Rajoy said Catalans had been fooled into taking part in an illegal vote. More than 2.2 million people were reported to have voted, according to Catalan authorities, out of 5.3 million registered voters. Just under 90% of those who voted backed independence, they said. A Catalan spokesman said more than 750,000 votes could not be counted because polling stations were closed and urns were confiscated. Given the chaotic nature of the vote, the turnout and voting figures should be taken with a pinch of salt, says the BBC's Tom Burridge in Barcelona. What have Catalan and Spanish leaders said? "With this day of hope and suffering, the citizens of Catalonia have won the right to an independent state in the form of a republic," Mr Puigdemont said in a televised address. "My government in the next few days will send the results of today's vote to the Catalan parliament, where the sovereignty of our people lies, so that it can act in accordance with the law of the referendum." The Spanish prime minister spoke of a "mockery" of democracy. "At this hour I can tell you in the strongest terms what you already know and what we have seen throughout this day. There has not been a referendum on self-determination in Catalonia," Mr Rajoy said. Spain's justice minister warned that any declaration of independence could lead to article 155 of the country's constitution being invoked which allows the national government to intervene in the running of an autonomous region. "We are not here to divide Spaniards... but if someone tries to declare independence on behalf of a part of Spain's territory, that cannot be done because it is beyond their powers," said Rafael Catalá. Spain's complicated relationship with the region of Catalonia is headed for the unknown. After violence by Spanish police, a declaration of independence by Catalonia's regional government seems more likely than ever before. On Monday the government in Madrid will hold talks with Spanish parties to discuss a response to the biggest political crisis this country has seen in decades. More than 40 trade unions and Catalan associations called a region-wide strike on Tuesday due to "the grave violation of rights and freedoms". 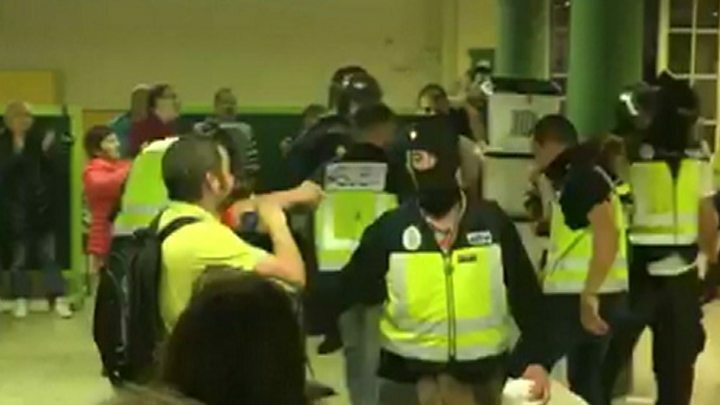 TV images showed Spanish police kicking would-be voters and pulling women out of polling stations by their hair. 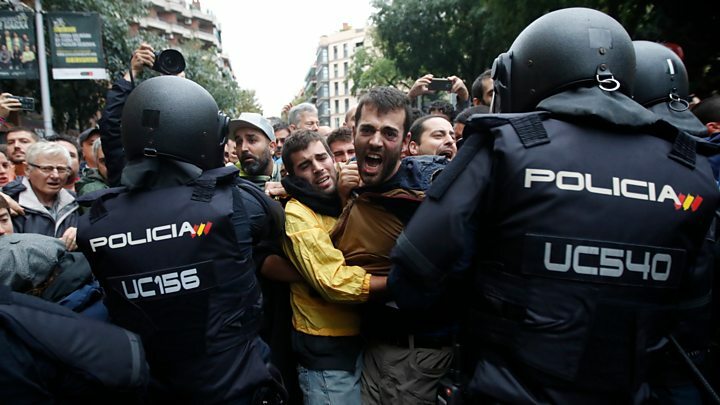 The national police and Guardia Civil - a military force charged with police duties - were sent into Catalonia in large numbers to prevent the vote. The Catalan police - the Mossos d'Esquadra - have been placed under Madrid's control, however witnesses said they showed little inclination to use force on protesters. Barcelona Mayor Ada Colau, who voted blank on Sunday, condemned police actions against the region's "defenceless" population, but Spain's Deputy Prime Minister Soraya Saenz de Santamaria said police had "acted with professionalism and in a proportionate way". Media captionVoters attempt to stop police seizing ballots. Some shouted: "We will vote! We are peaceful people"